From the DOMUS website: Curated by Tulga Beyerle and Thomas Geisler, “Exemplary: 150 Years of the MAK” celebrates the institution captained by Peter Noever for many years and now in the hands of Christoph Thun-Hohenstein. 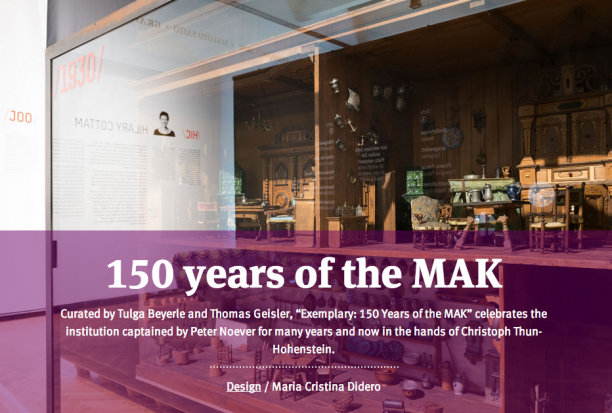 Vienna’s MAK is one of the most prestigious institutions on the international stage and “Exemplary: 150 Years of the MAK – from Arts and Crafts to Design” is the title of an exhibition curated by Tulga Beyerle and Thomas Geisler to celebrate the Austrian museum’s 150th anniversary. Founded in 1863 by the Emperor Franz Joseph and inspired by the South Kensington Museum in London – later renamed the Victoria and Albert Museum – the MAK logo features two griffons (Catherine Rollier’s 1987 original one was restyled two years ago by Perndl+Co). The museum has always been seen as both a collector of special pieces and a place for the research and training of Arts and Crafts creatives – people accustomed to using their hands. The exhibition centres on a comparison between the outstandingly rich and exemplary MAK collection (ranging from Adolf Loos to the present day) and the sensitivity of today’s avant-gardes, in a reiterated confirmation of the institution’s original mission to achieve an organic fusion of tradition and innovation. The exhibition project develops via an intense dialogue involving the pre-eminent collective invited; it is divided into nine sections and comprises several media directions, including not only objects and writings but films specially commissioned for the exhibition. The nine experts were asked to explore and vivisect the substantial resources of the MAK archives and write a story that winds through appendixes and subtractions, and features personal impressions, accompanied by specific historic references, in a balance of past and present or, rather, past and future. Neri Oxman's works include Imaginary Beings: Mythologies of the Not Yet.